As Director General, Christine has been running the communications strategy of the European Central Bank since 2013 and then set up the communications for the Single Supervisory Mechanism, the New European Banking Supervisor, which she is now also in charge of since 2014. 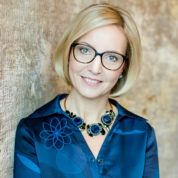 Before her move into the public sector, Christine was the founding partner of the German business of Brunswick in 2001 with a focus on communications in the financial sector. Prior to this, she was with Burson Marsteller in London for two years and started her career as an investment banker in the Corporate Finance team of Kleinwort Benson. A graduate of the European Partnership of Business Schools in European Business Administration, she was awarded an Honoris Causa Doctorate from Middlesex University in 2015. She serves on the board of TalentNomics, a non-profit organization supporting women empowerment. In addition she acts as a member of Generation CEO, of the German Baden-Badener Unternehmer Gespräche and supports various communications networks and initiatives.